Last night I made this really easy and delicious pie. 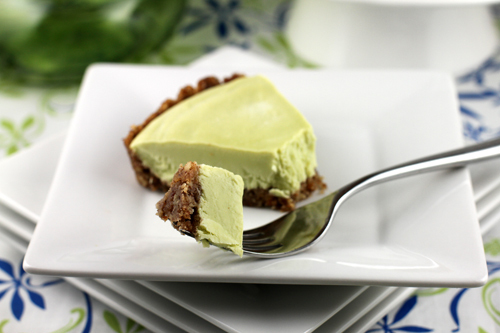 Who would have thought that avocados and limes can go together and make a dessert? The original recipe calls for a homemade crust, but I was lazy and just baked a frozen one. It turned out great. My picture (bottom) doesn’t do it justice. Heat the cream in a small saucepan until small bubbles form around the edges. Remove from heat, add sugar, and stir until sugar dissolves. Pour the liquid in a bowl and allow to cool. In a food processor, blend the avocado and cream cheese until smooth. Add lime juice and process again until smooth. Pour mixture into a bowl and whip in cooled cream. Pour into tart crust and place in freezer for at least two hours. Allow to soften on kitchen counter about 15 minutes before serving. Nic and I went to Canada for the weekend. We needed to get out of town for a bit. We left the dogs at home and my brother came up and took the dogs camping. It was our first trip without dogs in a while. We stopped off at the Soo Locks on our way up so that Nic could check them out. He had never been there. Then we made our way North. The weather was rainy and foggy, driving up through the mountains. We stayed at Crescent Lake campground for the first night. We were the only ones there. The bugs were AWFUL! We even drove back along the highway 40 miles to find somewhere to buy bug spray. The next day, we woke up and got ready to backpack. We started along the lake and planned to go a few miles. The trail was rated “difficult” and boy, they were not kidding! We were dying. Our packs were heavy. The trail was extremely hard and really wet. My feet were slipping around everywhere. And the bugs were once again terrible. So we stopped at the first campsite and called it good. It was a beautiful spot. Nic and I went to the humane society and got a new cat yesterday. His name is Guaco (Guacamole) and he is a 6 year old long haired kitty. The first thing he did when he saw the dogs is go up to them and rub on them. Stick could care less, but Fish is nervous that he will get in trouble. He seems to be adjusting well. We received our first CSA box of the year yesterday. It was very exciting! We also got a cookbook along with the box of veggies. Last night I made some baked kale chips with Parmesan and spices. It was delicious. I also made a tart for breakfast this morning. Nic loves this recipe. We mix it up with different veggies and cheeses too. Preheat the oven to 350. Spray a pie pan with cooking spray. Layer phyllo dough in the pie pan, brushing the melted butter between each layer. Check out this video for tips. Microwave (or steam) the asparagus and potatoes until they are somewhat soft. You don’t want them to be too mushy because they are getting baked also. Meanwhile, whisk together the eggs, egg whites and milk in a large bowl. Then add the crumbled cheese, asparagus, potatoes and spices. 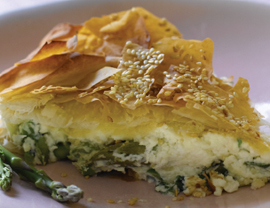 Pour the mixture into the prepared pie crust and fold the phyllo dough over the top. Brush again with butter. Then top with the grated parmesan. Bake at 350 for 20 minutes and then cover with tinfoil and bake another 20 minutes. Didn't get pictures of my tart, but it looked very similar to this! CSA stands for Community Supported Agriculture. It is like buying a “share” of a farm. You pay to get a box full of fresh vegetables delivered every week. We pay $22 a week for 20 weeks from Seeds and Spores Family Farm. And believe me, it is a lot of food for that money! If you still don’t know what a CSA is, check out this website . There is probably a farm in your area that offers one. Check this out! Pretty cool! The past couple weeks have been very busy! 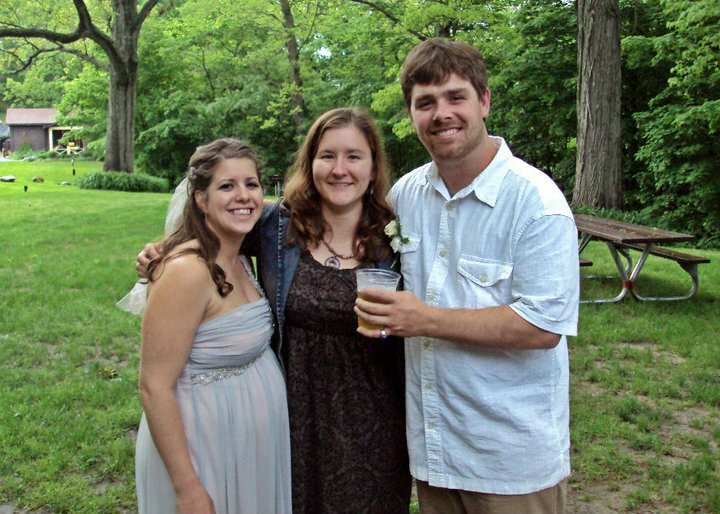 Last weekend, Nic and I drove downstate for a friend’s wedding. 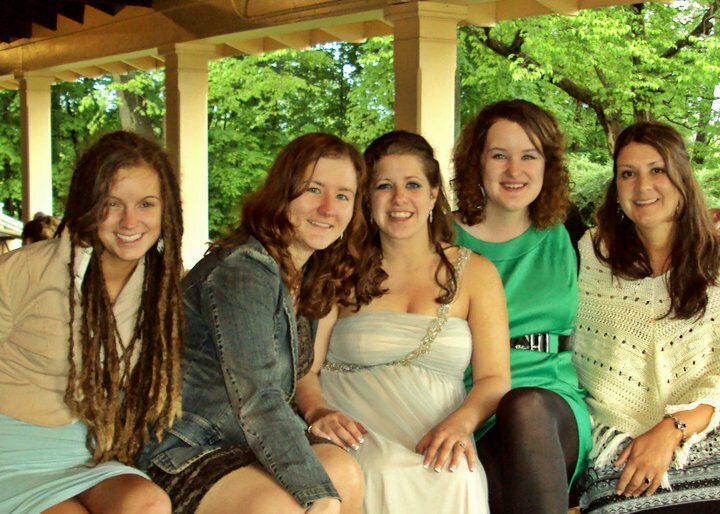 We stayed at my parents for a couple days and then drove down to Grand Rapids, where the wedding was at. The wedding was beautiful. It was my friend’s Eric and Liz from college. Great to see them and everyone from school. Some of them I haven’t seen since I graduated in ’08. This past weekend, the weather was great! We were close to 90 on Saturday. I did some painting in the kitchen, went to the beach, had a BBQ with friends and Nic and I went camping. We went to the upper Dead River falls. The bugs were awful!!! We gave up having a fire because we were being eaten alive. It was nice to sleep outside though. 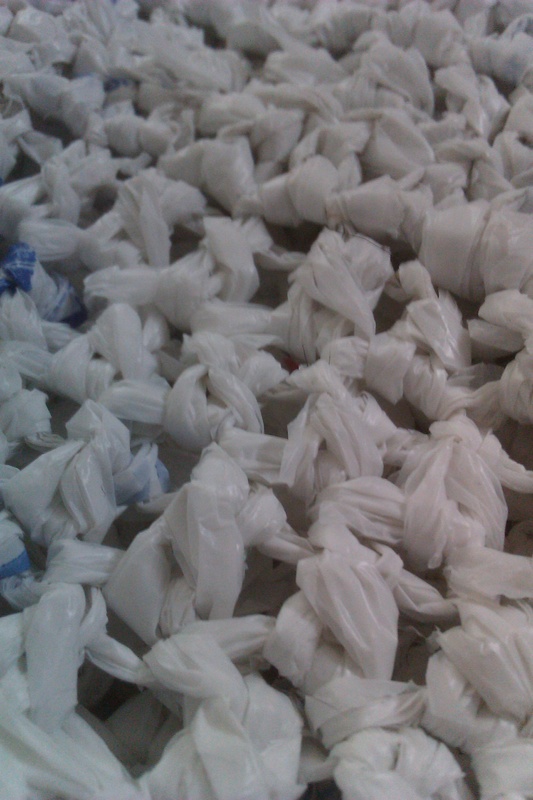 I had this grand idea of what to do with all of the old plastic bags that I had stuffed under my kitchen sink for the past few years. I had seen things before where people cut up and crochet old T-shirts and material to make useful accessories. So I took that idea and used it with plastic. After all of the bags were cut (I used about 35-40! ), I tied them together so that they made a continuous strand of “yarn”. 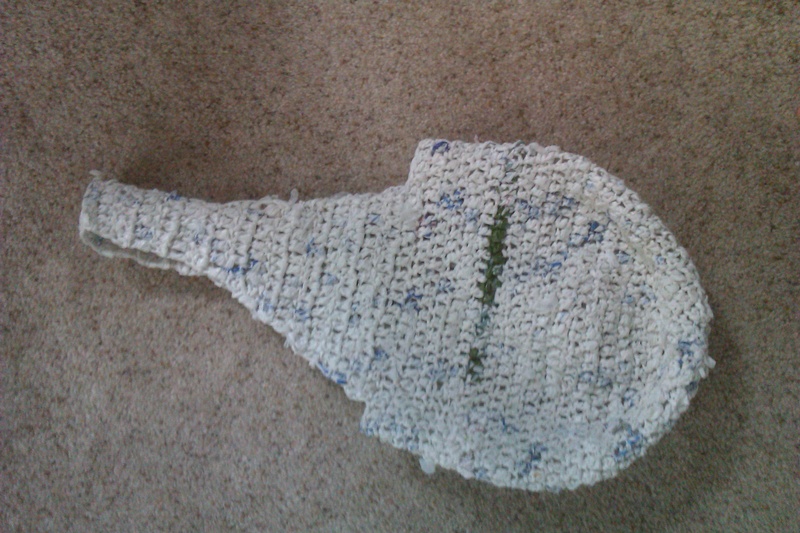 Then I started crocheting the bag. I just did a simple double crochet in a hat pattern, and kept going until it was the length that I wanted. I am sure that you could use many different stitches and designs. 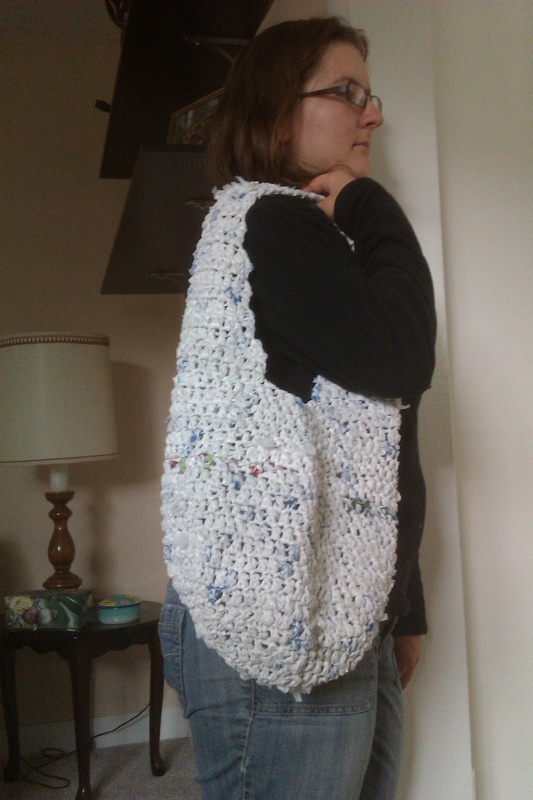 The finished bag is pretty stiff right now, but I think that it will stretch out nicely and turn into a good shape. Kind of a cool way to use up those old shopping bags!